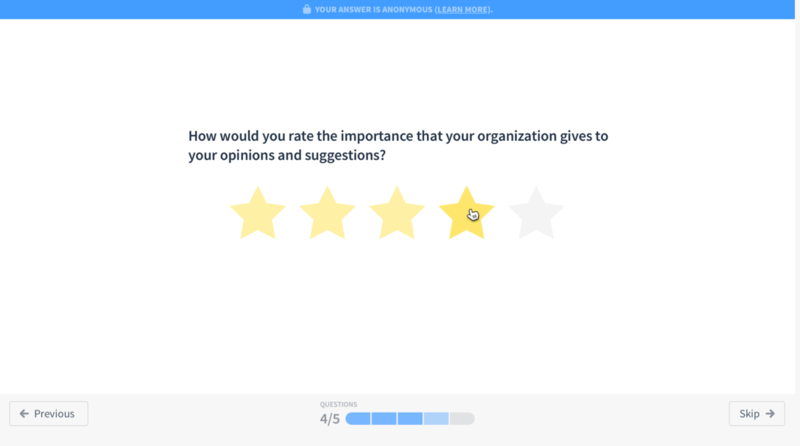 Officevibe pulse Surveys help you collect meaningful insights and honest feedback to help you proactively turn issues into conversations, and conversations into solutions. With short, weekly (bi-weekly or monthly), automated Surveys, we help Managers immediately identify areas of opportunity as well as their team's strengths. Just talking about it makes us feel like better leaders! We've created and curated a database of 120 science-based and interactive questions. 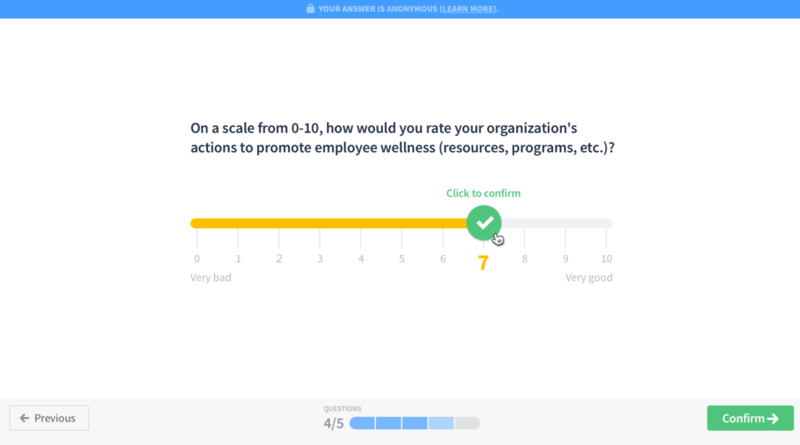 The Officevibe questions measure how employees feel based on the 10 Key Metrics of Engagement, which represent the 10 most important dimensions of life at work. These Metrics were identified based on research done by Officevibe and specialists like Gallup, Deloitte, Towers-Watson, and more. For more on these Metrics, head to The 10 Key Metrics of Engagement. A weekly Survey contains 5 questions and takes less than two minutes to complete. They can be sent weekly, every two weeks (10 questions) or monthly (20 questions), depending on your preference as an organization. A Pulse Survey implies that we are measuring the same things frequently. This means that Survey questions will come up again every ±3-4 months because it’s important to be able to measure change and notice trends for every Metric. We've also included the possibility for employees to choose not only when they receive their Surveys (day and time period) every week, but they can also choose the Survey delivery method, wether it be email, text message or Slack. Note: In order to paint an accurate picture of your organization or team as a whole, employees will not all be receiving the same survey questions. This helps provide you a complete picture of your team and also helps protect employee anonymity (Click here for more on Officevibe & Anonymity). 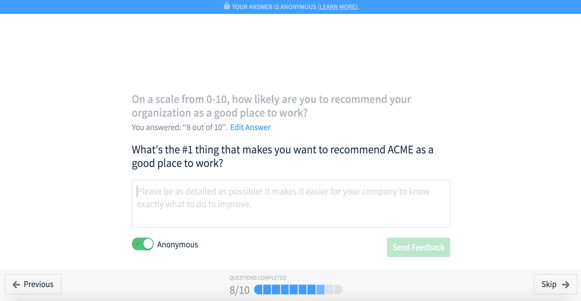 Officevibe Surveys are meant to be simple, interactive and fun to do! We've included different types of questions, so employees can express themselves in various ways. Below, we've included several images that take you through the different types of questions. For one out of the 5 questions, your employees will be prompted to leave feedback via a follow-up question. So what happens once employees have answered their Officevibe questions? Great question! 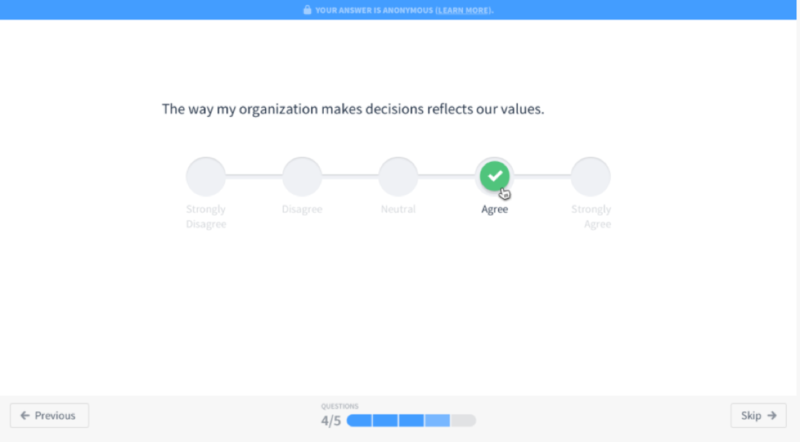 We've designed a Survey exit screen that allows employees to contribute their opinion on topics that are relevant to them within their current context. 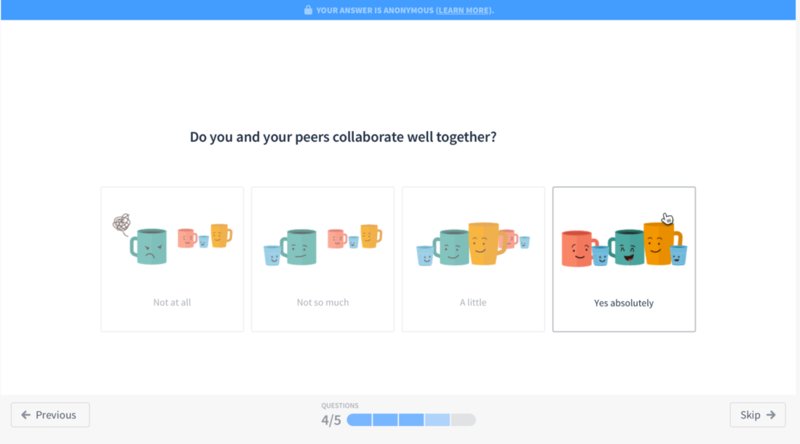 When they reach the Survey exit screen, employees are thanked for sharing their thoughts and reminded that they can choose on what day, at what time and in which language they can receive their surveys by clicking on Edit Settings. With scores for Metrics being calculated over 90 days, a tool such as this can help managers obtain fresh data faster. Given that employees hold the same weight under any given Metric, the ability to answer more questions will not give certain employees more weight than others. It will simply provide fresher and more up-to-date data. Additionally, Officevibe only considers someone’s last response to a question within the last 6 months; therefore, an individual cannot be counted in twice. Sharing the details of how we gather data and crunch those numbers is super important to us. For a comprehensive recap of everything there is to know about the Officevibe approach take a look at The Science Behind Officevibe.